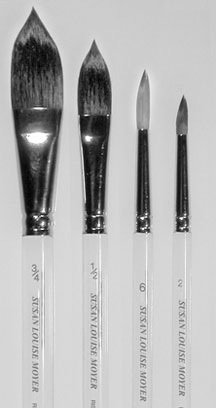 Includes three artists brushes (small #4, medium #8 and large #12). Each brush is a combination of soft absorbent squirrel hair (which holds a lot of dye) and a resilient synthetic fiber for blending color on silk. Just to confuse you we are now offering the sable brushes. Everyone who tries them says, "I have to have this brush." They are a luxury. Three ways to apply liquid dye by using this versatile brush. Paint in and around small motifs with the point, long narrow areas with the side edge, and backgrounds and blotches by using the flat edge. 7/8 inch wide ferrule. Filberts are a narrow flat brush with hairs that come to a rounded edge. 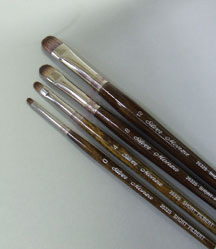 It can be used flat and on its side for blending and making various brush marks. For DyeColour? 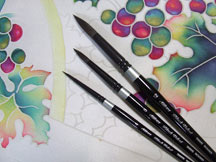 painting on silk, a Monza filbert brush gives me the ability to blend dye without causing dye to build up along the edges of a shape and assists me in executing hard and soft edges. It is also useful for making various brush marks. I am very excited about this brush. It expands my creative options which makes DyeColour? painting more fun. When working in the traditional resist line technique, where dye can build up along the resist line, I use this filbert brush to pull and blend the dye away from the resist line. It also works for blending and integrating the colored lines and edges that are created during the linear underpainting process. I call this my magic brush. My students agree. © Moyer Design, Inc. 2003-15. All rights reserved.